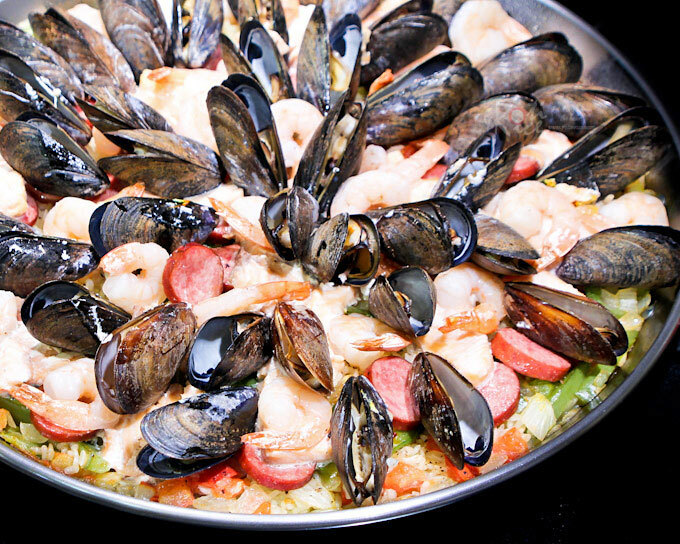 Fabulously tasty and attractive Seafood Paella with sausage, salmon, shrimps, and mussels. It is an experience you don’t want to miss. 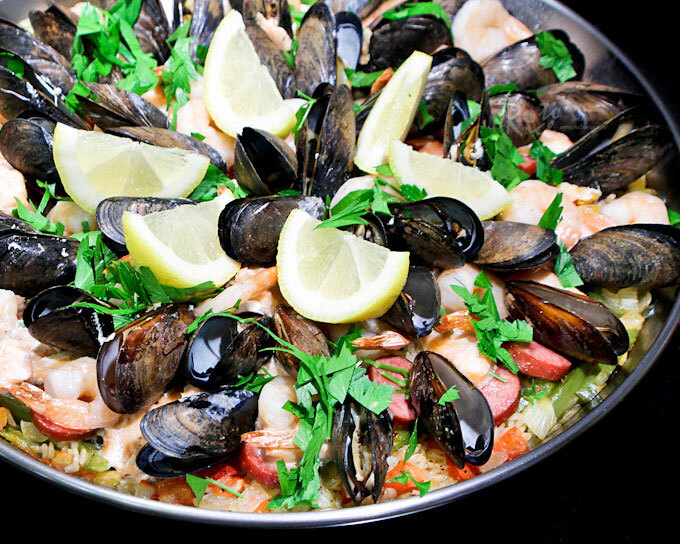 Seafood Paella is a favorite at our house and is often requested for special occasions. As such I always try to keep some saffron in my spice rack because it is an essential ingredient in paella. Saffron is an expensive spice and it is worth its weight in gold. Fortunately, a little goes a long way and only half a teaspoon is needed for this recipe. Since last weekend was a long weekend and both Ro-Taro and Ro-Jiro would be home from college, I considered it a “special” occasion and weekend. I wanted to surprise them with this dish because I know they both love it. That meal turned out to kinda Mediterranean as I also made this Fresh Fig Lettuce Salad. Everything was delicious including the vinho verde Ro-Ri San and I drank. This time I used my shallow 13½-inch paella pan to make this dish which produced a nice layer of toasted rice known as socarrat at the bottom of the pan. Traditionally, paella was cooked over an open fire uncovered. However, when cooked on the stove, I prefer to use a lid so that the rice will be thoroughly cooked. Otherwise, you may have to add a little more water and extend the cooking time to ensure that the rice grains are cooked through. Good thing I found a lid from an electric wok that was large enough to cover the paella pan. 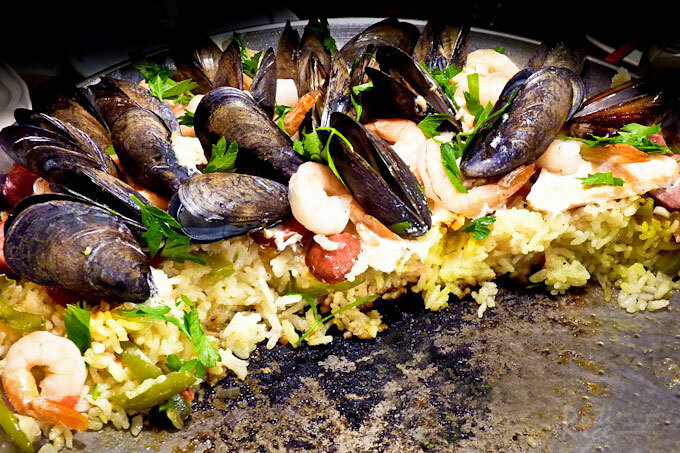 If you do not have a paella pan, please use any shallow pan with a lid. A cast iron skillet would also work. Just grab a lid form some other pan. Heat olive oil in a 34 cm paella pan or large shallow pan. Brown sausage for about 3 to 4 minutes. Remove and set aside. Saute onions, garlic, tomatoes, and bell pepper for 3 minutes. Add rice and stir fry for another 3 minutes. Pour in white wine and chicken stock. Crumble in the saffron. Season with salt and pepper. Cover, reduce heat and allow it to simmer for 12 minutes. Return browned sausage to the pan. 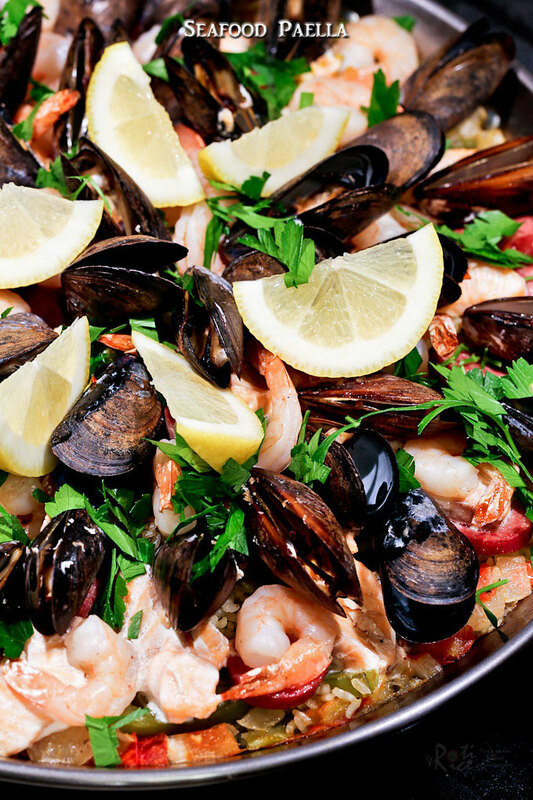 Layer salmon, shrimps, and mussels around the pan. Cover and cook for 6 minutes. Remove lid and transfer pan to the oven. Bake uncovered for 10 minutes to finish cooking. Remove from oven and let it sit on stove top for 10 minutes. This is what it looks like straight out of the oven. Beautiful right? It will look and taste even more amazing with a sprinkling of parsley and a few lemon wedges. I hope you’ll give it a try.